Waterproof Inkjet Film - Helping you make garments and personalized products! 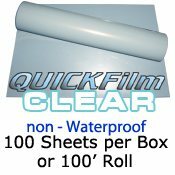 QuickFilm MAX Clear Film is the best clear Non-Waterproof inkjet film available. Want to see how good QuickFilmMax is? Grab our free sample pack (just pay shipping). 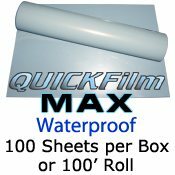 QuickFilmMax has a special coating for density, dot control and was developed specifically for the screening market.